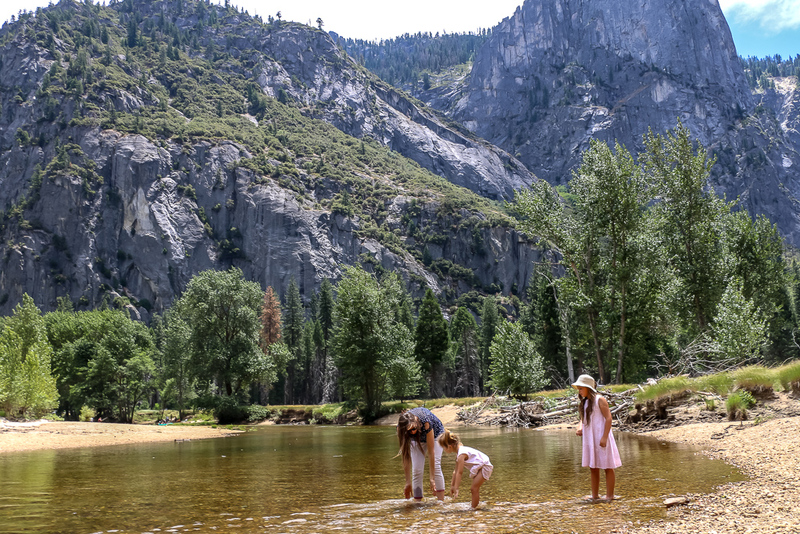 Crossing Yosemite National Park off our travel bucket list! Finally after years of dreaming and thinking about this place, on one Sunday afternoon, out of the blue, we made a simple plan – two weeks from now we would be hunting for famous Yosemite waterfalls. No further arrangements, no advance booking, no thorough research and preparation – just a couple of days of road tripping through southern and central California, from sunny Los Angeles to the mesmerizing Yosemite. The rest was a journey in making! On the day of our almost spontaneous adventure, we left LA before the sun painted the sky in the bright colors of the dawn. A little bit over five hours drive with just one stop to refill tank of the car… Not an easy, but manageable task! Guided by Yosemite Fall as our final destination on iPhone Google map and geared by excitement and anticipation, we arrived at the park in the late morning. As we entered winding, gradually ascending road, astounding landscapes undoubtedly indicated that this was the right place. On the right, sheer mountains almost completely covered with abundantly growing trees towered over the road. Bubbling river with morning sun glitter reflected in its crystal-clear waters accompanied us on the left. Yes, this was Yosemite! A place we were longing to explore. Another half hour passed before we reached entrance gate with a few employees, relentlessly accepting payments and giving guiding instructions to new and returning visitors alike. As soon as we parted with our $35 and drove through a small tunnel-like entrance, our excitement knew no bounds. We were absolutely ready for the extraordinary views and dazzling waterfalls. Sure enough, it didn’t take us even ten minutes to drive away from the entrance when my niece started screaming with exuberance: “Waterfall! Waterfall!” Indeed, to the right of the road, majestic Bridalveil Fall was hiding from the annoying glances of tourists. With loud sound it released the waters plunging from a height of 617 feet. Upon reaching the ground, the waterfall “tears” gathered together, creating lovely streams. We didn’t merely observe the waterfall from the distance. Oh, no, quiet the opposite. Without second guesses, our entire group climbed extremely slippery rocks and approached mighty Bridalveil Fall as close as it was safely possible. Our new location provided us with a clear view of the mist from the waterfall source and the foggy mountains nearby. For those who don’t have any interest in climbing the rocks, Bridalveil Fall is visible from many locations in the valley. Furthermore, it flows throughout the year to the delight of numerous visitors of the park. Our next stop included visit to Yosemite Falls. 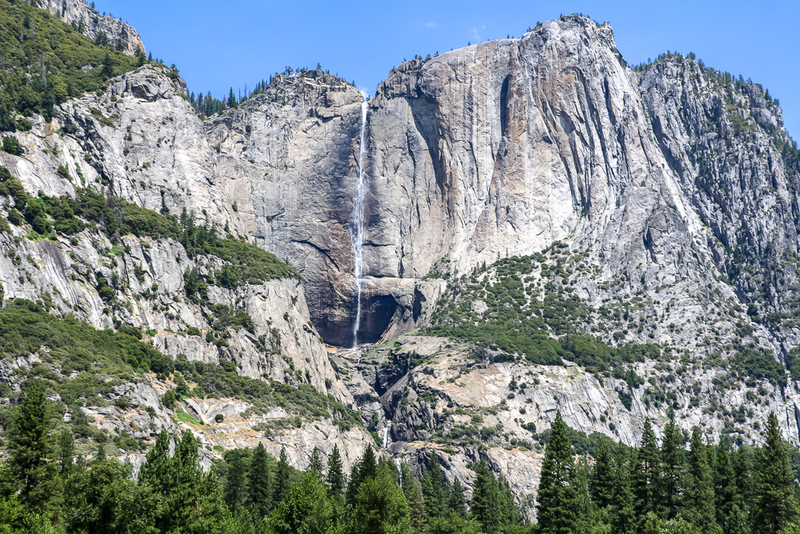 With the water dropping from a height of 2,425 feet from the top of the upper fall to the base of the lower fall, this namesake of the park is considered the highest waterfall and one of the main attractions in Yosemite National Park. Yosemite Falls is seasonal waterfall. Strong and powerful in spring, it almost dries out by August. On top of that, spring daytime temperature is perfect for long hiking. A two-miles Yosemite Falls Trail usually takes up to three hours to reach the base of the waterfalls and get back to the valley. We were determined or, at least, wished to cross this place off our bucket list as well. At that point, with lost Internet connection and no way to get the GPS service back, our “gang on the wheels” simply followed other cars, hoping that they would lead us to some place worth stopping and admiring. 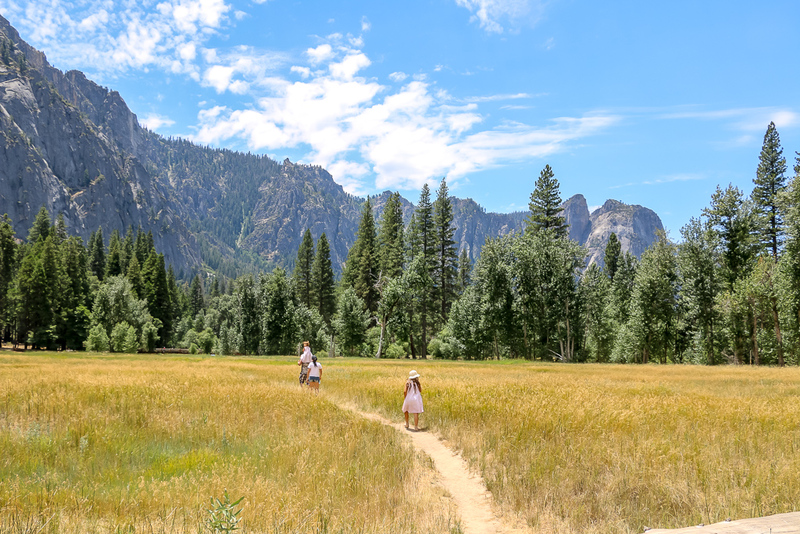 Such “great” plan worked out pretty well, and we found ourselves in Yosemite Valley, parked in front of Yosemite Falls – our top destination of the day. What a beautiful view opened in front of us! Sentinel Meadow with green and some patches of yellow grass invited all visitors to follow its well trodden paths to, what it first looked like, the famous waterfalls. But the nature is full of surprises. Merced River, not Yosemite Falls was awaiting the travelers at the end of the trail. A river that could be easily crossed, but its crystal-clear water charmed and kept all random visitors unwilling to leave the sight. 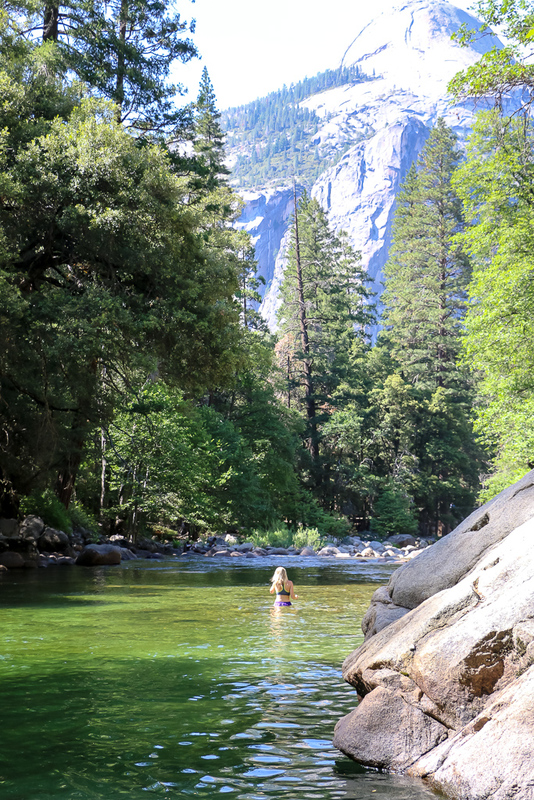 Merced River with its crystal-clear water charms and keeps all visitors unable to leave it. Honestly, it was a little bit sad not being able to hike all the way to the waterfalls, but we quickly focused on other things we planned for the day. Moreover, as one of the park employees mentioned, our visit fell on the busiest day ever. During her extended career, she couldn’t recollect such crowds. Consequently, with so many people driving to the park on a particular day, finding parking was next to impossible. After many circles around Yosemite Valley, we finally were lucky to claim one single spot in the whole huge parking lot. Once stopped, our car was meant to stay there until the time to leave the park. From the parking lot, we took free shuttle and, relying on the instructions of a friendly park associate, ventured to Happy Isles (shuttle stop #16) in eastern Yosemite Valley – a starting location of Vernal Fall hike. The trek was approximately 0.8 likes long. A relatively flat at the beginning, paved pathway slightly twisted around the mountains and was becoming steeper and steeper with elevation. Most visitors followed the trail to a wooden footbridge with an incredible view of the waterfall. Oh, this is how you look like, Vernal Fall! The 317-foot waterfall is indeed a place not to be missed. Loud, powerful, and incredibly beautiful sight is mostly famous for rainbow mist, created as the water plunges down, and green foliage surrounding the fall all year long. Vernal Fall is especially gorgeous at its peak flow, which usually happens in late April and early May. However, the rest of the year doesn’t present dramatic changed to this fall unlike Yosemite Falls. 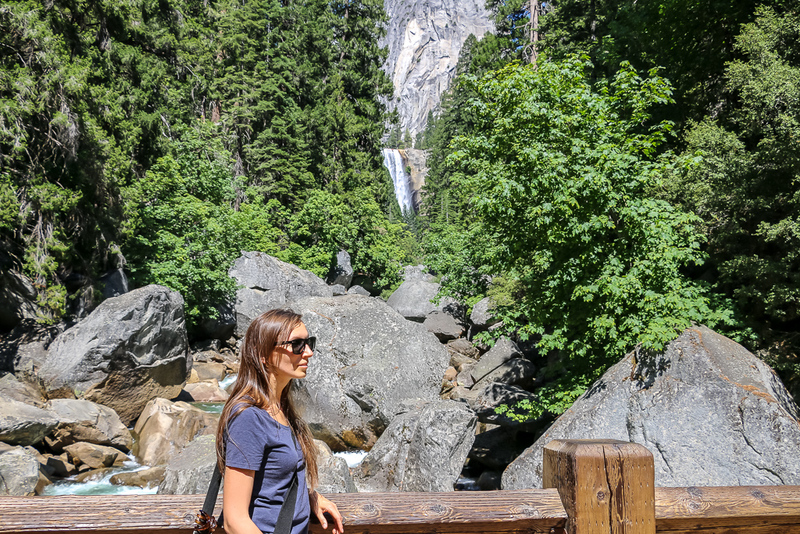 Once on the footbridge, you have a choice to stop your hike and return back or walk about 0.7 miles farther up to the top of the waterfall where the most determined visitors get rewarded with the epic, up-close views of the fall and spectacular vistas of Yosemite Valley. And then another 1.2 miles of walking uphill and you reach the forth waterfall of the day. A 454-foot high Nevada Fall on the Merced River (just like our previous fall) is nestled below the granite dome at the west end of Little Yosemite Valley. Together with Vernal Fall, our last destination on the list creates a unique system of the waterfalls that quiet often seems like two parts, downstream and upstream, of the same natural phenomenon. 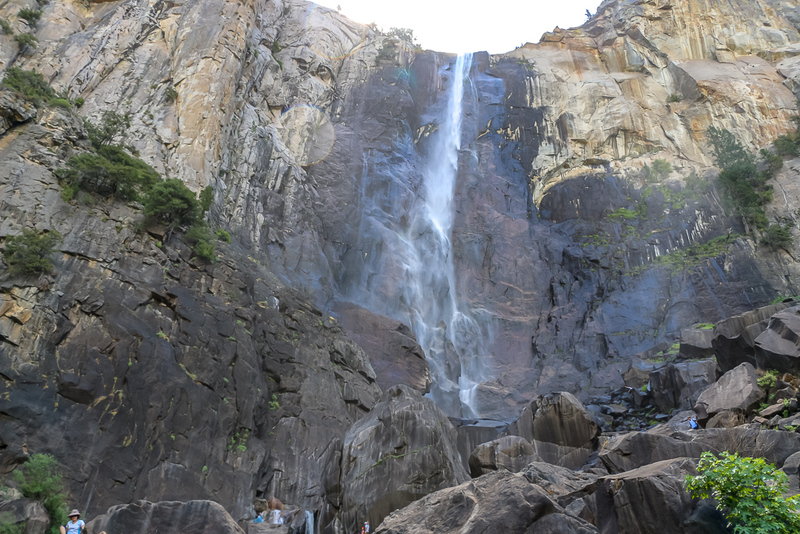 Similar to its downstream sibling, the Nevada Fall runs almost the whole year with the exception of late August when the water flow doesn’t reach its maximum potential. On the downside, the access to this fall is closed in winter, so make sure to see it during warmer seasons. Yosemite National Park is incredibly big and absolutely gorgeous. One day will enable you to only scratch the surface of what it has to offer. Nevertheless, 12 to 24 hours are more than enough to explore four of the most remarkable waterfall of the park. 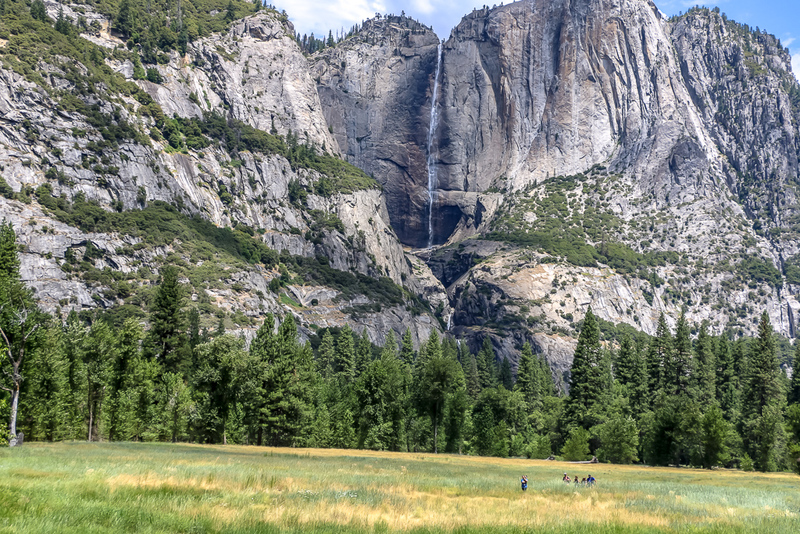 Bring your loved ones along and enjoy the stunning scenery, dramatic views, and mesmerizing falls of Yosemite.